The literature on ethnic minorities in China has a significant puzzle: in some studies, urban minorities perceive lower wages relative to the majority Han, while in other studies there is little to no evidence of this wage gap. There is not a clear theoretical expectation as to how these findings could simultaneously be true suggesting that new theory-building is necessary. We propose that the primary issue, and a potential solution, is the failure to fully disaggregate ethnic minority groups’ labour market experiences. We leverage a new, large dataset solely looking at ethnic minorities in China to explore this divergence. Our results suggest outsider minorities, e.g. Tibetans and Turkic groups, have a 20-25 percent wage penalty controlling for covariates, while minorities in aggregate do not appear to have a significant wage gap. These findings are robust across several different specifications, and have notable theoretical and policy implications. 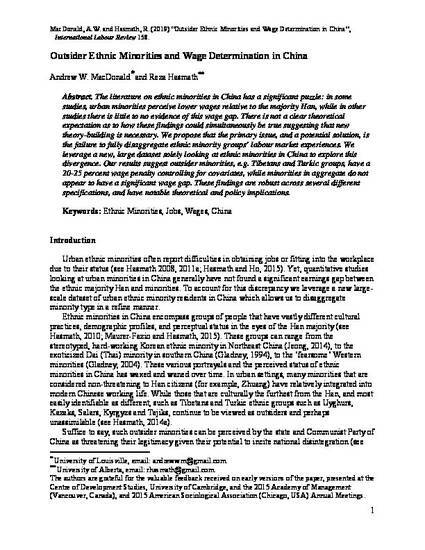 MacDonald, A. and Hasmath, R. (2019) “Outsider Ethnic Minorities and Wage Determination in China”, International Labour Review 158.